No, I’m not talking about the TV show. Nor am I talking about the Robert Kirkman comics on which the TV show is based. Not that those aren’t important, because they are. They made a huge splash culturally and they do a lot of really interesting things. But what I want to talk about today is not the comics or the TV show, but the Walking Dead video game (y’know, based on the comics and the TV show), which was released by Telltale games as “Season One” and “Season Two.” Each season is structured by episodes (which you could buy individually as they came out), and the format makes it seem like you’re playing through a Walking Dead miniseries. In Season One, you play as a Black protagonist. In Season Two, you play as a Black protagonist. There’s also a DLC — which I have not played — which has five different protagonists, including (and I’m using the game’s wikia “ethnicity” tags here) an “Asian-American” man, an “African-American” man and two “Caucasian-American” women. Only one of the five protags is listed as a “Caucasian-American” man. I haven’t played the DLC yet, so I won’t really be focusing on it here, but I thought it was worthy of mention. Lee, the protagonist of Season One, and Clem, the protagonist of Season Two (as well as an NPC in Season One) are both fully fleshed-out, strong, compelling characters. The game also does not shy away from issues of race, and your PC’s race matters to the other characters in the game. Remember in the TV series, when Andrea got a lot of flak both from other characters and from fans for daring to challenge the whole women do the dishes/men do the shooting division of labor? Well that conversation never really comes up in the video game. Why? Because Zombie Apocalypse is why. The characters in the game are way too busy running for their lives to try to divvy up “gender-appropriate” roles to each other. It’s the zombie apocalypse. Everybody shoots, and everybody takes care of the baby. In Season Two, Clementine is eleven years old. The Walking Dead is a “horror survival” game, which means that, at most points, your goal won’t be to defeat an enemy, but to stay alive. (And therefore you don’t have to be a tank for the game to make sense.) And the fact that Clementine is eleven, and as such only has the height, reach, and endurance of an eleven-year-old, actually matters to game play. Fighting off zombies by hand is harder for you than it is for the healthy, adult members of your group. (Which makes fighting the zombies off that much more rewarding.) And the fact that you are a child is important to the people you interact with, as well. Other characters react to it, sometimes shielding you from danger because of it and sometimes dismissing you out of hand. As a child, you usually have less power and less authority than the people around you. In an industry full to the brim with adult male action heroes (often the leaders of whatever team they’re in), it’s nice to see a little girl’s point of view. She may not be a physical powerhouse, but Clementine is brave and determined and she can hold her own in a world full of people (and zombies) who are bigger, stronger and faster than she is. In Season One, Clem’s role was largely to be protected by Lee. It’s nice to see her come into her own in Season Two. Now, The Walking Dead is a pretty linear game. No matter what you do in this game, what choices you make, more or less the same things are going to happen in each episode. Most of the time, you’ll have no true influence on where your group goes or on who dies. And yet, the choices in this game matter in some ways more than the “choices” I’ve made in any other video game I’ve played. Because these choices have less to do with determining an outcome than they do with defining, and refining, your character’s morality. Will you save the person you like the most, or the person you feel is most useful to the group? Whose side will you take in a fight? When will you lie to survive? Or steal? Or kill? Those are the kinds of decisions you make, and even if, from a plot perspective, they don’t matter much, the game is very good at making them matter personally. To the protagonist and to the player. Apparently I’m following Anita Sarkeesian’s career. And while I’ve been interested in her projects ever since I first heard about her, and that was well before the Tropes vs. Women in Video Games series ratcheted up her visibility like woah,* I never really actively planned to keep tabs on her. That’s right, folks. If you have trouble keeping up with all of your Sarkeesian-related news, there’s a handy document over at the Feminist Frequency website in the form of a downloadable PDF (note that the link is to the page where the PDF is hosted, not the PDF itself): “Feminist Frequency 2014 Annual Report.” It has links! It has graphs (and other data visualization stuff)! It has pink and teal headers! There’s also a “Media Interview Link Round up for October 2014,” just to prove there really was a spike in the Anita Sarkeesian news coverage at around that time. I was invited to speak at Utah State University on Wednesday October 15th, 2014 about women’s representations in video games. Sadly, the university received a series of emails threatening to commit “the deadliest school shooting in American history” if I was allowed to speak on campus. When USU and Utah police refused to screen attendees for firearms, citing the state’s concealed carry laws, I was forced to cancel the event. Below is a round up of media interviews I have done recently speaking about the threats in Utah, the epidemic of gendered harassment online, and the larger problem of sexism within the games industry as a whole. So, basically. More terrifying death threats! And gun control laws (or the lack thereof) that make those threats even more terrifying. 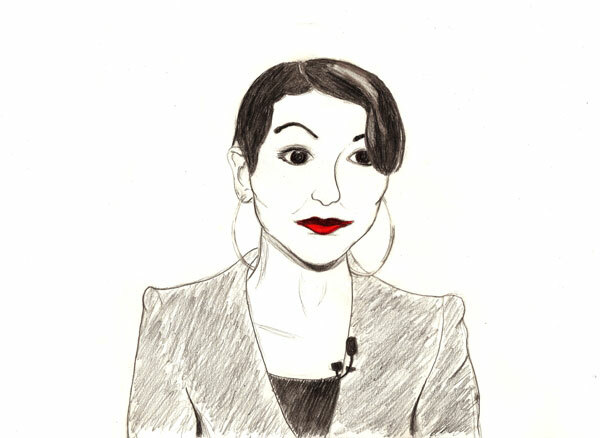 In the second video, Sarkeesian (briefly, obvs) articulates how she developed her own feminism, which is cool if you’re interested in or even just curious about where she’s coming from, and the kinds of frameworks she’s been using/is using to contextualize her arguments–whether on sexism in popular culture or on the systemic misogyny of online harassment. On a somehow lighter but also somehow terrifying note, David Futrelle–at the hilarious but also soul-crushingly depressing MRA-mocking blog We Hunted the Mammoth**–has been following the development of the “Sarkeesian Effect” project, and you can find a bunch of those posts under the “Sarkeesian Effect” category tag at his site. What, never heard of the The Sarkeesian Effect ? (I wouldn’t have, if not for Futrelle’s blog.) Well, you’re in for a . . . um, not a treat, but . . . a . . . a something. Anyway, the Effect is apparently a proposed “feature-length documentary” about exposing the evils of the evil SJW agenda. So, there’s your sign, I guess. For in-depth mockery of both the project and the dudes making it (and I can’t wait to see what up-and-coming comedy duo gets cast as Davis Aurini and Jordan Owen in Anita Sarkeesian’s first biopic), see Futrelle’s posts on the subject. * That’s right, haters. I watched Feminist Frequency videos before it was cool. A hat tip to my bestie, L, for introducing the series to me. ** I say “soul-crushing” because I can only read so much misogyny–even secondhand, on a blog that exists for the express purpose of mocking said misogyny–before it starts to get to me. I haven’t updated much lately, but the good news is that Anita Sarkeesian has. On November 18th, she released the video “Ms. Male Character – Tropes vs. Women,” which is the 4th installment in her her Tropes vs. Women in Video Games series.